Do you want to eat the best ice cream in Venice? Or as Italian says “Il miglior gelato”. If there is one thing Italians are obsessed after their cuisine and coffee – it’s their gelato. 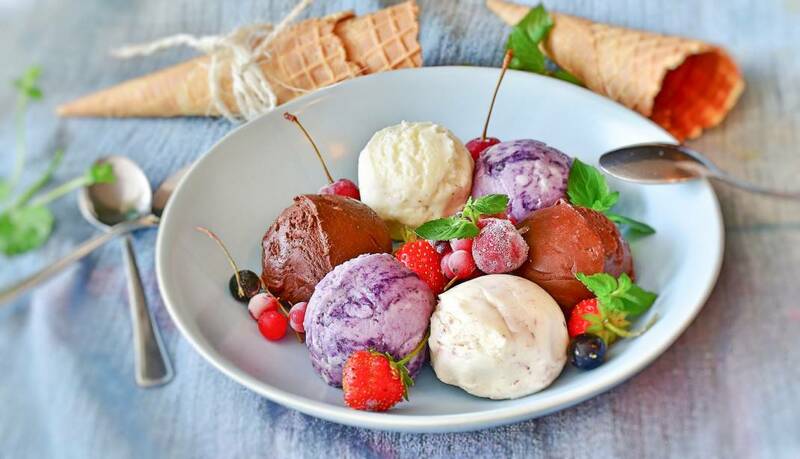 Smooth, creamy, naturally flavored, crispy scones and smiley faces, those are what you should be looking for the best gelateria – ice cream shops in Italian. You will notice even in Venice, you will have a hard time to choose because there will be an ice cream shop in every corner. Here is our list for 9 best place for gelato in Venice! It’s summer time and you have been wandering around the labyrinth-like island for so long. You want to give a break and probably something cold and refreshing. You deserve the best gelato in town! Ice cream shops are one of the most vibrant shops in the streets with their flavor display and colorful cups & cutlery they are serving. It’s almost like they are handing out joy and sparkles to the town and the people coming over. For a little pause and to enjoy the mixtures of insanely delicious flavors, take this journey. Enjoy the best refreshment in Venice maybe after your meal or your aperitivo. We are pretty sure that you will enjoy walking around bridges and beautiful buildings with a nice treat – like the best gelato in Venice – . La Mela Verde is a small green ice cream shop located in Castello area of the island. It’s known for artisanal home-made Italian style ice cream – that’s what their motto is. One flavor is about 2€ which is great. They even serve Panna Gelato which is sweet bread filled with ice cream. Green apple (mela verde) is their signature flavor. Not a coincidence when it’s also the name of the shop. Gelati Nico is located in the lowest south part of the main island. It’s a little bit off the way for the usual touristic path. However you can be assured that it’s worth coming down there. It’s a local recommended place. Not a fancy showcase either. You can get their coppa –glass cup– as it’s the most favorite version for gelato like gianduitto. The cups are filled with the flavors you want and usually they add fresh fruits and crispy biscuits. The view outside is amazing. It’s an excellent place to rest and dig into gelato. Strategic position of the gelateria is quite important. When the sun is out and it’s getting hotter, you need a remedy for that. La Boutique del Gelato serves greatly for that purpose. It’s situated in the midway of the road going through from Rialto Bridge to St. Marco Square. Gelato here is rich and has firmer texture rather than creamy. They also offer granite, frappe and foccacina con gelato – another type of bread and ice cream combination. La Boutique Del Gelato ? Gelateria Il Doge is another favorite of locals since 1986. It’s located in Dorsoduro area near Ca’ Rezzonico Museum. Aside from serving delicious gelato, Il Doge has a great variety of ice cream for people following a special diet. Such as lactose-free, vegan, gluten-free and organic flavors. They also offer Sicilian style granite and milkshake. Their signature flavor is Crème Il Doge. A splendid combination of vanilla ice cream, crispy chocolate layer all covered in chocolate orange sauce including candied orange peels. Suso is a gelateria raved by everyone who visited here. The display looks super attractive from outside with the all colors of the flavors they have. Usual flavors are 1.80€ each whereas their own creations are around 2.20€. The signature flavors have very unique names as well such Manet or Opera. Manet is a blend of hazelnut and salted pistachio and it’s the most popular flavor in Suso. Plus, it’s only one street away from Rialto Bridge. Well, yes: Venchi is a chocolaterie. However when you have this kind of a divine ingredient what else do you make with it? Gelato! Your nose and palate is invited to a festive here. The smell of chocolate and the caramel notes from the cone is like a dream. Along with the ice cream, they offer ice cream crepes and of course you can always ask for extra chocolate spread on top. Ca’ D’Oro is a family owned and managed gelateria in Canereggio area. They use fresh and natural ingredients and proud to make homemade ice creams. The most interesting of part their ice cream is the flavors since they have very peculiar ones. The flavors are usually combined together such as ricotta with honey and sesame or spice custard with almond and raisins. They also sell ice cream on sticks produced by them which is quite rare nowadays. Carlo Pistacchi – the owner and gelato maker in Alaska is a very genuine character. Although he might not known as the most polite owner here, he definitely knows how to handle the big world of ice cream flavors. When you work on marginal flavors it might be difficult to turn them into something that all people can like. Well he does it! Spice aromas such as ginger, turmeric, cinnamon and also more eccentric ones like tamarind or rose sorbet are well recommended here. Another big ice cream spot in the touristic path is Gelato Fantasy. You can find your favorite junk food as an ice cream flavor here. Even your favorite pastry! Cheesecake, Sacher, Nutella, Oreo and Kitkat are among the options. Like most of the gelateria in the island, they offer granite and also crepes.